As exclusively revealed by Mike Peters during another very special Keynote Address at this year’s Gathering event, the third generation era of Alarm music will continue on March 15th 2019 with the official release of ‘Strength 1985-1986’. 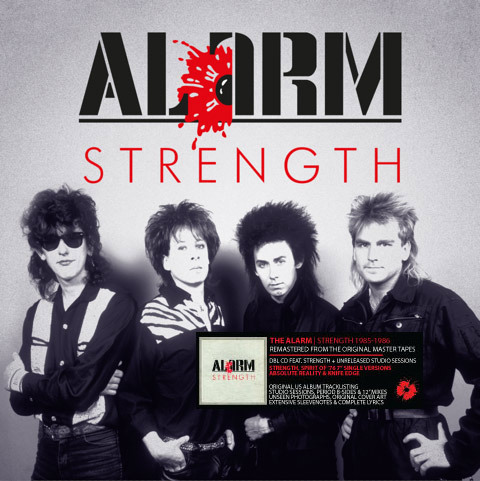 All individual CD and LP pre-orders placed through thealarm.com will qualify for a Free CD that is exclusive to the alarm.com entitled: ‘The Alarm – A Story of Strength‘ featuring a host of exclusive Alarm tracks and narration by Mike Peters. 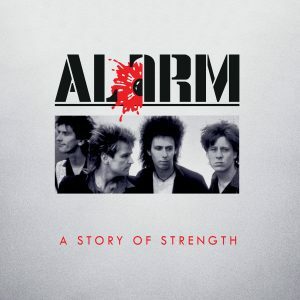 This fascinating CD tells the entire story of The Alarm’s Strength period from 1985-1986. The band’s classic 1985 album Strength has been expanded, remastered and revised for future generations to enjoy and will be made available for pre-release online and in record stores worldwide from February 4th 2019 onwards. The comprehensive re-mastering process has been undertaken to allow the band’s music to fully embrace digital and online streaming services and ensure the music of The Alarm can be listened to by future generations as intended by the band, when recorded and committed to tape for all time. 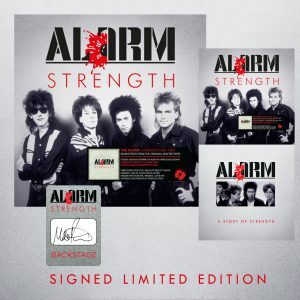 Strength 1985-1986 is being released through The Twenty First Century Recording Company – which has been ‘home’ to all Mike Peters and The Alarm music since 1994. And so, on Monday February 4th 2019, The Alarm – Third Generation era 81-19, continues with the online premiere of a new remastered video for The Alarm’s ever popular album track ‘Deeside’ which will be followed during the build up to the release with other unique video premieres at the official alarm youtube channel. 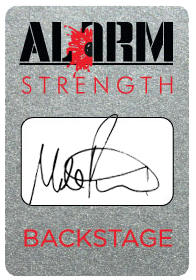 thealarm.com will also continue the enormous task of re-telling the story of the band via a lengthy Alarm YouTube Channel campaign, that will follow the timeline of the group from where the last series left off in 1985, right through to 1986 and the seminal concert at UCLA known as the Spirit Of ’86 Concert. A Screening of Mike Peters taking part in th classic BBC Television show ‘Pop Quiz’ hosted by Mike Peters is available to view at The Alarm You Tube Channel now, followed on Monday February 4th when the pre-order window opens by the Online Video Premiere of remastered album classic ‘Deeside’. Please follow The Alarm today on YouTube, Twitter, Instagram, Facebook and Spotify to stay in tune and ensure you don’t miss a thing! STRENGTH 1985-1986 CD Editon – Features the US album along with the original 1985 7″ version of Strength (with the guitar / vocal beginning), that has never been issued on CD before along with the 1986 7″ single version of ‘Spirit Of ’76’ which is also making its first ever appearance on CD. All four original ‘Strength’ period B-sides are included also. The Second disc features 22 previously unreleased album session recordings including outtake versions (with different lyrics and guitar parts), for every song on Strength including an outtake of the unreleased electric version of ‘One Step Closer To Home’. An in studio jam session of spontaneous and impromptu covers of Led Zeppelin, The Who, Free, T-Rex, Lou Reed and Deep Purple are featured between tracks along with a complete run through of the previously unreleased live in the studio version of Rod Stewart’s Maggie May which segues into re-workings of The Beats ‘Stand Down Margaret’ and Bob Dylan’s ‘Maggie’s Farm’, providing a fascinating insight into The Alarm working together in the studio on the way to creating their magnum opus. SIDE ONE & TWO – Features the UK album remastered from original 1985 mix and running order. All digital pre-sale orders will be sent immediately, one advance album track (with others to follow), leading up to the official release date of March 15th 2018.